DON’T SLIP UP ON SLIP-AND FALL INJURIES! 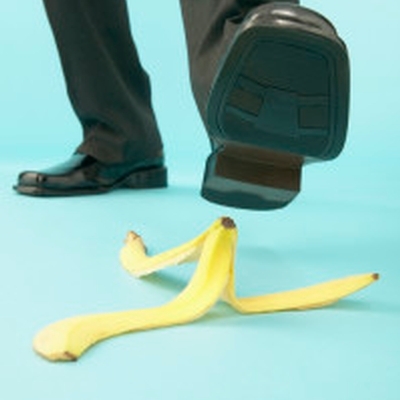 HomeBlog ClassicConnecticut Business InsuranceDON’T SLIP UP ON SLIP-AND FALL INJURIES! With slips, trips and, falls remaining one of the top causes of workers compensation claims, safety experts stress the need for preventive measures and ergonomic workplace design. Such accidents need particular attention in nonindustrial environments where employers often install terrazzo or marble floors that can be dangerous to walk on. According to the U.S. Bureau of Labor Statistics, same- level slips, trips and falls (in which workers slip and fall on the surface where they’re standing) accounted for 134,580 lost workdays and 111 deaths in 2011. The number of same-level falls increased 42.3% from 1998 to 2010, the highest growth of any accident type during this period. These mishaps are costly, in 2010, Liberty Mutual a a leading workers comp insurance company, paid $8.61 billion in same-level fall comp claims. Implementing safety measures such as, cleaning spilled liquids promptly and placing floor mats on smooth flooring will help prevent workplace injury. Reviewing injury records to find trends will help determine additional safety measures to implement in the workplace. Many businesses are replacing surfaces that contribute to these mishaps which is a highly cost effective investment that can curb expensive litigation and workers comp liabilities. Although these precautions have prevented thousands of slip-and-fall accidents, the risk will remain a problem until employers work with design professionals to create ergonomically friendly safe buildings. The National Institute of Occupational Safety and Health (NIOSH) is sponsoring a “Prevention Through Design” initiative to address ways that architects and engineers can get involved in designing safer workplaces (for example, by training college engineering and architecture students about safety and ergonomic considerations). Tracy-Driscoll‘s workers comp specialists would be happy to check your business for slip and fall hazards and recommend steps to help keep your staff and visitors from slipping.